Ruth Gustafsson was a journalist and a municipal and parliamentary politician of the Social-Democratic party. She played a very important part in the establishment of the Social-Democratic women’s movement. Ruth Gustafsson was born in Stockholm in 1881. From the time she was a child her life was influenced by the ideas of the workers’ movement through her family members. The pro-union aspect came via her father, Teodor Pettersson, an overseer, and she adopted it when she worked as a coat seamstress in her younger years. Her mother, Anna Pettersson, was also a convinced socialist. When she was not quite 21 years old Ruth Gustafsson joined the Social-Democrat women’s club in Stockholm, along with her mother, on 3 March 1902, and thus they also became members of the Social-Democratic workers’ party of Sweden (SAP). It was perhaps as a newly accepted member of the Social-Democratic youth club on Söder (south side of Stockholm) in 1904 that she first met Hjalmar Gustafsson, a metal-worker, who was also a member of the club. She would go on to live with him in a common-law marriage from 1906, which became a legally ratified marriage in 1912. Ruth Gustafsson’s period in the youth club appears to have set her on a leftist-radical and anarchist path, although later in life she would belong to the ruling Social-Democratic establishment. As a delegate at the 1905 SAP congress she, in direct contrast to several other prominent women in the party, supported Hinke Bergegren’s motion seeking to prioritise the struggle for women’s suffrage and she later backed him in the dispute which led to his exclusion from the party. Towards the end of the first decade of the 1900s she was a member of the board for the Stormklockan newspaper, whilst her husband served as co-editor along with Zeth Höglund, one of the couple’s closest friends. 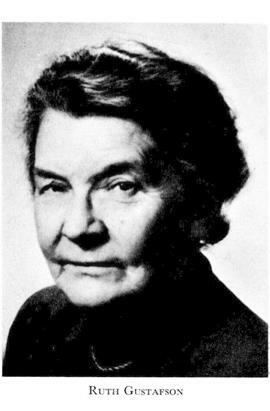 Ruth Gustafsson was also editor of the Social-Democratic women’s movement’s journal Morgonbris. However, she only lasted a brief time in this post. It has been claimed that this was due to the fact that she allowed a series of articles on birth-control to be published. She later returned to work with the journal from 1919-1921. It is clear that Ruth Gustafsson’s particular interest in mothers who lacked the financial support of a man – whether unmarried, married, or widows – originated in her personal experiences. Following the death of her father in 1901, leaving her mother with ‘many needy children’ she had, as is implied in Morgonbris, seen with her own eyes ‘how heartlessly unfair society is with regard to the protection of women and fatherless children’. During her nationwide tours seeking to rouse the population she would often speak about the rights of unmarried mothers. Two of the most important issues for Ruth Gustafsson were suffrage and political equality between the sexes. She felt these matters were so urgent that she supported a group of bourgeois women at a pro-suffrage call to Karl Staaf’s government in 1905. Suffrage was also the theme of her most important speech, which she gave at Ladugårdsgärde in the spring of 1918 following developments in the parliament’s first chamber which prevented democratic breakthrough from taking place. Other issues which were integral to Ruth Gustafsson’s activism included the likes of improvements to poor relief and introducing the teaching of abstinence in schools When she, along with her husband, joined the Stockholm city council as a representative in 1919 social and educational matters were thus her main concerns. During 1923-1924 she also held the important post of member of the newly established ‘stadskollegi’ (municipal board), which corresponds to the modern-day municipal council. She remained a representative for the Stockholm city council for almost 20 years. In 1932 Ruth Gustafsson was elected as a member of the parliament’s second chamber, where she would contribute to several enquiries. Ruth Gustafsson got divorced in 1934. She was the mother of two children: her son Arne and daughter  (Vanja Lantz). Ruth Gustafsson’s political career really took off after she left parliament in 1948. She died in Stockholm in 1960, at the age of 79. She lies at the Skogs cemetery in a grave along with her children and her son-in-law. Ruth Valborg Maria Gustafsson, www.skbl.se/sv/artikel/RuthGustafsson, Svenskt kvinnobiografiskt lexikon (article by Ulrika Holgersson), retrieved 2019-04-20.